Line bottom and sides of 5-quart oval slow cooker with single sheet of cooking parchment paper, and spray with cooking spray. In medium bowl, stir Topping ingredients until crumbly. Set aside. In large bowl, stir Cake ingredients until blended. Pour into slow cooker. Place folded, clean dish towel under cover of cooker. This will prevent condensation from dripping down onto cake. Cook on High heat setting 1 hour. Carefully remove slow cooker’s ceramic insert, and rotate insert 180 degrees. Sprinkle topping over cake. Replace cover with dish towel under the cover. Continue to cook on High heat setting 30 minutes to 1 hour or until toothpick inserted in center comes out clean. Transfer ceramic insert from slow cooker to cooling rack. Let stand 10 minutes. Using parchment paper, carefully lift cake out of ceramic insert, and transfer to cooling rack. Cool completely, about 1 hour. Remove parchment paper. In small bowl, beat Glaze ingredients until smooth. Drizzle over cake. 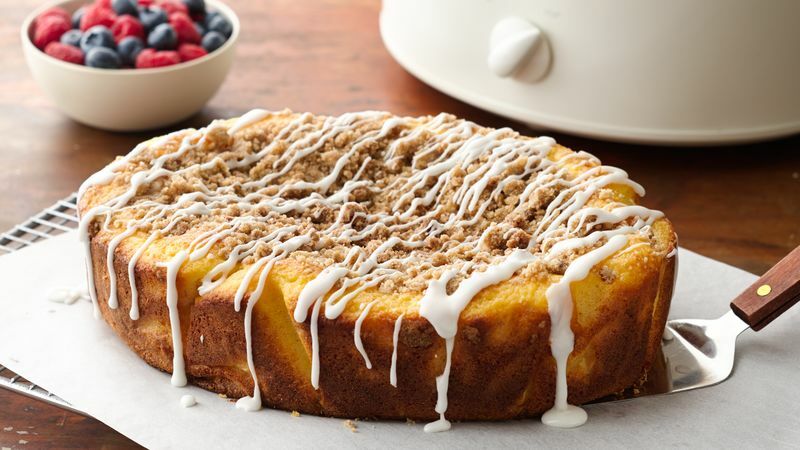 For an even easier version, you can skip the glaze, and sprinkle powdered sugar on top of cooled cake. If preferred, 1/2 cup chopped toasted walnuts or pecans can be mixed into the topping mixture.